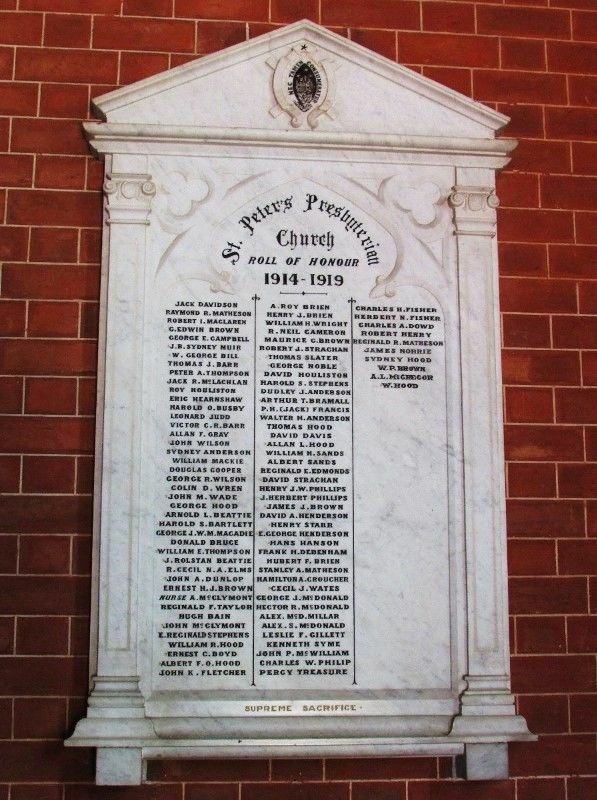 A marble honour roll commemorates those connected with the church and parish who served in World War One. The honour roll was originally unveiled in 1917 and contained 80 names. Additional names were added at a later date. COWRA, Monday. At the Presbyterian Church yesterday, in the presence of a large gathering, representing all denominations, the Rev. James Barr unveiled a roll of honour, containing the names of eighty members of the congregation who have enlisted in the Expeditionary Forces since the outbreak of war. Among the number are some who have been killed in the service of the Empire. Others received a baptism of fire at Gallipoli, and are now in France, whilst many are reported missing as a result of the recent offensive on the Western frontier. Over 450 from the town and district have been accepted for service abroad, and the majority have been in the firing line. Sydney Morning Herald (NSW), 22 May 1917.